Thanks for the info. Guess I won't purchase after all. Ray - In the fine print at the bottom it says you agree to be rebilled yearly, which was my first red flag. However, it also says you can cancel at any time, so you should be able to do that. I notice someone else above had the same problem. You may have to cancel your card to get it to stop. Not good news I know. That's why I never use my credit card on the internet. You notice they don't use PayPal? Another red flag, because PayPal will refuse payments for you if you notify them. If congress or the senate EVER passed such a law against lying you should know all of the politicians in this country would be in jail and we would have to spend Billions more for the room required to keep them. You know, congress should pass a law on lying, Rio may have a point-6mo for lying. It seems that is just a matter of doing business today. If they can get it past you...they win. It's not 'what kind of business can we have that is fair true to the people. Noooo...politics,government, investors...anything to get your assets. Anywhere from shady to downright illegal with little recourse for the victims. I've just spent a couple of hours on this one and if weren't for 'reviews I probably would have fallen for it. Sorely disillusioned I've been scammed locally as well as internet. It is a scam plan and simple! You can go to www.congress.gov and check for yourself. Enter 2015 Consumer rebate act and up comes H.R. 4283 and it has only been presented to lawmakers it has NOT been passed into law as Oxford club states. They are liars only trying to get your money. Also, the IRS has NEVER heard of any such rebate. Steer clear guys! I PAID THE AMOUNT OF 79.00 FOR ALL OF THIS INFORMATION FROM OXFORD CLUB. NOW IT LOOKS LIKE I AM IN FOR A SCAM . USED MY CREDIT CARD, MAYBE IF I PHONE MY CREDIT CARD TO STOP AS THIS WAS AWHILE AGO, OVER A MONTH . Another reason to vote for Donald Trump!!!!!!! Tks Roger for being the man of God you are. -You are a better person than I. Just Once I'd like to see someone who has scammed me/my family get their just deserts! What put up the red flag for me was while we taxpayers were forced to allow our taxes be used in the Big Bail Out of the huge financial institutions, the money we taxpayers lost was not and will probably never be received by us. If we owed the government the amounts due us, we'd have to pay up immediately. However, the losses we incurred are "supposed to be returned by our not having to PAY the government should we owe any funds. Well, that was a lie! We are retired, my husband is disabled, I was charged nearly $700 for using Obama Care! (Which by the way those payments doubled the next year making it's premiums as high as anything else! Would you be surprised to learn that wasn't an "allowable" deduction from the thousands the government owes us? You can't win. The only way one can get ahead in this country anymore is to come from somewhere else with absolutely no skills, collateral, also bring your whole family and "let the freebies begin!" Our Founding Fathers would roll in their graves if they knew what was going on here and they were no Angels. At least we can still have our say without being shot, arrested or disappearing. . .so far. -There should be a law against fraud. . .oh, wait! There is! Of all the responses; yours hit home; our family is just keeping our heads above water, looking for a row boat. There are more low to average people and families (investors) than, above average. spent 30 mins plus listening to their spokesman's drivel, hoping this wasn't a scam. alas it was not to be. I just did the same thing, thinking all the time this can't be true. Bottom line, if it sounds too good to be true it usually is. HEY I CALLED MY ACCT . HE LAUGHED FOR 30 MIN. Thanks, this is excellent, it was glamorized basic knowledge, but never the less some folks don't have it. Any one who does not pay a state income tax should definitely check it out. Now I've just got to ascertain from this largely junk heap whether their investment tips are worth paying for. The people who claim to be members are happy, but are they real? I am so glad I did my due diligence. 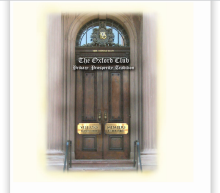 From the comments I've read the Oxford Club is a scam and selling misleading information. I was interested in the rebate too; that's the hook to bring uninformed members to their club. I have noticed with all the advice to stay away from the Oxford Club only one person mention anything about the rebates. Did anyone get any of the rebates from the government? You can see their track record via Hulbert Financial Digest. They're in the top ten. No but I did some checking and the rebate they mentioned you can see for yourself. Go to www.congress.gov and type in 2015 consumer rebate act up pops H.R 4283 so it is real. Oxford club left out the part about it just being introduced to lawmakers it is NOT a law as they claim. Also, so mumbo jumbo about it being a rebate only on purchases of coal, oil ect. Also, the IRS has never heard of it. Tell everyone you know Oxford club are crooks big time!!! Did anyone actually receive the 4 reports from The Oxford Club that claim to put immediate money into ones pocket? I noticed many comments on bad investment advice and that they are scam artists, but no one commented specifically on whether these documents were total crap or actually work. I appreciate the feedback. SCAM! Throughout the 30 minute presentation you are constantly told they want to send you this information for FREE! At the end of 30 minutes you are told how wonderful they are to allow you to receive these previously FREE publications for a mere $49. Exactly!!!! I am so sick of listening to these kinds of videos only to discover they want your money!!! There must be a law regarding dollar amount and their legal liability. All of these things offered up on internet are $49. They must have some protection if it's below $50. Good attention paying; FREE is just that. But,few people stop themselves, like you, by saying to themselves, "This is supposed to be FREE!" What's FREE then; your loss of 30-40 minutes of time, and hopefully the "tuition" for the Education you got from this. I'm glad I read all the reviews on here... saved me a bit of money. I am sure if we all do our research we can find the same things he talked about in the video on our own. why doesn't someone take out that Oxford Club gang?. The money is out there to do it.